As a geeky teenager, I used to read the nutrition information labels on foods for entertainment. Early on, I noticed a few things that sounded somewhat peculiar out of context. For example, I was stuck by how difficult it was to guess what a food was from its nutrition information. This worked both ways though: what foods had in them was quite difficult to guess just from knowing about them. Years later I realised that this is the sort of thing that some food scientists work on. I learnt that we have ended up thinking that water is the healthiest food around, chiefly because it has nothing in it. I also saw that olive oil is only ninety-something per cent fat. Sugar, on the other hand, is a full one hundred per cent carbohydrate. Health benefits aside, I was immediately intrigued by this revelation. (a) Why was something called ‘oil’ not completely oil, and (b) How could manufacturers get away with olive oil not being the full monty? Looking at different bottles, to see whether it was just that one I found out that some were 85% fat and some were more like 95%. This prompted my third question (c) Why did it vary so much? The difference between 85 and 95% at is a bit of a shift for something that has the same name. It was my first inkling that both marketing and food scientists had a lot to answer for. However, the drama was moot in any case: TV chefs rattled on as much about good ingredients then as they do now, and cheap stuff was not as good as expensive stuff then either–so the chances were we were not being duped on a big scale. The question remained though: What is the stuff in olive oil that is not fat? What we need to do to answer this question is a bit of scientific analysis. Nuclear Magnetic Resonance (NMR) Spectroscopy tells us that the dominant compound in olive oil is a triglyceride made, mainly, of unsaturated fatty acids. A typical triglyceride is shown in Figure 1. One of the other ways we know it is a triglyceride, and the method used before NMR was invented, is by studying how it reacts with other chemicals. Specifically, if one part triglyceride reacts with three parts of potassium hydroxide, to give three parts fatty acid and one part glycerol, it was seen as bona fide triglyceride. Figure 1. 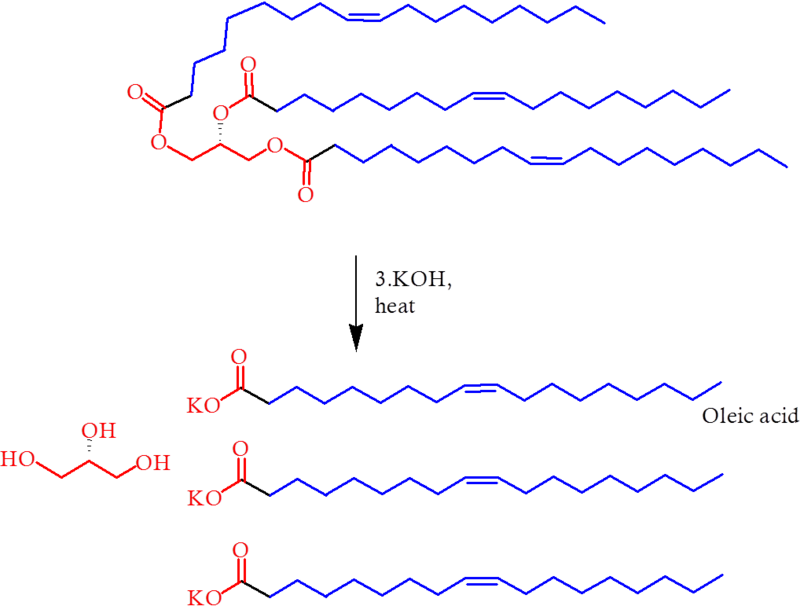 The saponification of a triglyceride (top), giving rise to glycerol (bottom left) and three moles of fatty acid (bottom right). This reaction (Figure 1) is also the key to why olive oil is only ninety-odd per cent fat – apart from the green colouring. A calculation of the molecular masses tells us that glycerol represents around 10% of the mass of triglycerides, which is not a fat. This is why olive oil is not 100% fat. Expert bakers will tell you that glycerol, also known as glycerine* is quite sweet to taste and dissolves in water. It is also used to stop icing becoming dry and brittle. It is thus not a fat, and so is not listed under the fat content on the nutrition information. When I realised this, I was a bit surprised at my original view. My reaction to the contradiction I first saw had been turned inside out. Now I know that olive oil that does not have 100%, or nearly 100% fat in it, because it is principally composed of triglycerides rather than fatty acids. As this means it has probably seen less processing than other foods, it is therefore likely to be of a better quality. This also reflects well on the materials used to make it, because good olive oil does not need to be processed at all. *Also used to make nitro-glycerine, the explosive that is in dynamite.